During the television broadcast of Art in the Twenty-First Century, Season 6—Art21’s latest PBS-broadcast season of the Peabody Award-winning series—we invited viewers to submit questions for a few of the season’s featured artists. Published here are responses from artists Catherine Opie, El Anatsui, and Marina Abramović. Q&A #2 with Mary Reid Kelley and assume vivid astro focus: Viewers are invited to submit questions for Mary Reid Kelley and Patrick Kelley and Eli Sudbrack of assume vivid astro focus. Watch videos featuring each of the artists and submit your questions on PBS.org. The artists will respond to select questions, which will be posted here later in the month. From Leungs via PBS.org: What influenced/inspired you to photograph in a minimalist theme in the Surfer/Ice fisherman series? How did you come up with the idea to use the bodies of people as pieces of landscape themselves? Catherine Opie: I think the stillness for me comes with the sense of waiting for such great length[s] of time in both places to accomplish the photographs. I am using an 8×10 format to photograph with and there is much patience that comes with shooting in this format, which [is] translated to the work. From Darrell Roberts via PBS.org: I find many of the gay photos hard to look at—I grab my gentiles, hold my breast and squint in pain [sic]. Not so much in the landscapes, they allow me to get away and go some place peaceful in my head. Have you photographed gays in a less fetish[ized] way? CO: It is interesting for me to hear that you find the photographs fetishistic. That was never the catalyst in making the work. It was to really create a very bold body of work of my community. [That work] began to create a [type of] documentation in the moment that AIDS had decimated much of my community. The politics surrounding homosexuals was—and still is—at times, daunting. From Inga via PBS.org: I enjoyed the interview and learned about the extensive body of photographic work you have done over the years. My question is the following: Do you have one single favorite photograph taken by you that you consider both timeless and most relevant to you as a photographer? CO: Self Portrait Nursing (2004) is my favorite as an amazing moment of fulfillment in having a child. From Temizl via PBS.org: Like the impressionists, I see that the quality of light is important? How is it different for you? CO: Not much different. Light is everything in photographs and has to be considered in all situations. I want to seduce my viewers and be able to hold them with the work. Much of that is done in terms of formalist ideas that I bring to the work. From Temizl via PBS.org: Again, landscape was very important for impressionist artist, as it is for you, however, how do you choose the landscapes that you do? CO: I think that it comes from my own desire of also seeing if I can accomplish certain kinds of landscapes that are interesting for me to create. From Leungs via PBS.org: With your ceramics piece (broken pots), what goes into your decision on how the broken pieces get placed? 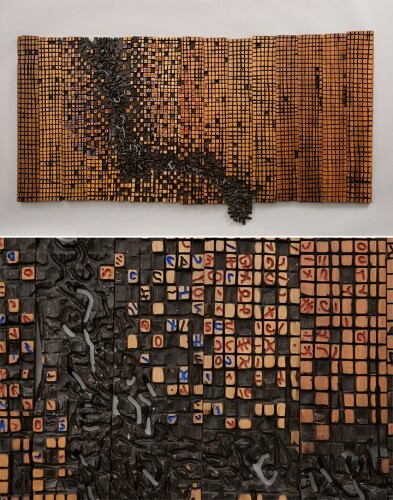 El Anatsui: Put this piece next to that if it makes the form look shattered, mixed up, and re-configured; not in a jigsaw fashion because that will mean trying to rebuild an old life instead of creating a new one with elements, memories, or contents of the old—a richer, more-informed life. EA: My works are not paintings, but [they] have the attributes of paintings, so I’ll take it from there. We are collectively conditioned by the many centuries of seeing paintings on framed rectangular canvases. Install[ing] anything like a painting, [we are] unconsciously guided by the tradition of four corners: to be balanced [and], in some cases, with plumb lines or spirit levels. We even have lost sight of the earliest paintings in caves, which were not on flat surfaces but followed the contours and have the 3D feel of sculpture. It is ironic, but one of the most unusual installations of my work was in an exhibition in the Vatican [in 2011]. I arrived, curious to know how an institution renowned for conservatism would hang the piece I sent without any guides for its display. To my pleasant surprise, they took great advantage of the freedom offered by the absence of ‘hanging instructions’ and the flexible nature of the piece and got a result which created its own outline completely different from the work’s rectangular starting point, with a little portion flipped over the top of the panel on which it was mounted and an edge right inside it. It had a seeming[ly] diagonal and casual feel to it, like a shirt just tossed on the floor, creating its own new format not subservient to the edges or form of a shirt. Later I met the curator who told me how many trials and how long it took them to arrive there. I felt, for once, I’ve seen a piece take others through a creative process, the kind I want the other pieces to do. From Rayamber via PBS.org: I notice from your segment [in] “Change” that most of your studio assistants are men. Is this a conscious choice? If so, why? Along those lines, your art-making processes seem aligned with those of painters, sculptors, and fiber artists. Would you also consider yourself a community artist? Why or why not? EA: [My] first two pieces were done with a female assistant. [However], when I needed more assistants later, boys living in the vicinity of my studio were readily available, so the tradition grew out of that. A couple of girls who expressed desire to work in the studio developed cold feet after seeing so many boys on their first visit, but I think eventually the tradition [will] be broken. When [my] works travel out, the assistants who work with me are mostly women and I see they have a more sensitive approach like the first ones I worked with. My resources, materials, and human [labor] are sourced from the community, and I believe that make[s] me a community artist. The ideas I work with, even if sourced from the community, address issues that go from the community to the outside world. They have universal resonance [and] relevance. I believe that makes me not [exclusively] a community artist. From Sophie Sanders via PBS.org: In your exhibition catalogue for the traveling exhibition “When I Last Wrote You About Africa,” Olu Oguibe observes that patchwork has always been an important part of your process aesthetically as well as conceptually. How, in this twenty-first century experience of Africa and the world, do you see the function of the fragment? EA: Today, our 21st century world is fragmented and divided into two camps. One is a superpower in decline, and the other [are groups] growing [with] implacable fanaticisms. Still, almost everywhere, not just in Africa, narcissistic and degenerative political and economic leaders have led our societies into various stages of decay. Democracy is perhaps synonymous with Criminocracy, as so-called globalization exposes the underbelly of the atomization of nations, societies, communities, and individuals. This fragmentation and the resulting “patch-patch” have always been around, though less discernible. The African Diaspora, for instance, is a direct result of previous societal dislocations and fragmentation of the African continent: the dire consequences are still with us, mentally and structurally. Nonetheless, “fragments” can—and do—serve positive functions, such as breaking bread into fragments with wine symbolizing communion and the coming together of the disparate into a unified whole with common purpose. I have come to regard the function of the fragment as a useful tool in my practice, with which to explore and analyze life as it is, and not what we want it to be. From Sophie Sanders via PBS.org: Chika Okeke-Agulu argues that adinkra symbols provided you with untapped graphic possibilities for contemporary art and its loaded symbolism gave you a new basis for inventing a transmedia visual language. How does your use of pattern function differently in the ceramic than the wood [and] the metal cloth sculptures? What sources of pattern most inspire each series? EA: My initial take on [adinkra] symbols was not about patterns. I was interested in them individually. Although I studied them graphically, my interests were in their forms and content—the ideas they [express], especially their engagement with abstract, immaterial concepts. My “discovery” of them [was] in school [when we] learned about the European renaissance, with its focus on visual verisimilitude. The narrative made me think [of] two approaches: one valorising [the act of] seeing with the eyes, and the other, seeing with the mind. If there is pattern discernible in my works, they are not the destination but just means to the bigger picture [and] statement. They are like words coming together to form sentences, which grow into paragraphs, and may eventually end in a book. From Rachel Denny via email: I very much liked your idea of having simultaneous celebratory funerals, my own father recently passed away and it would be nice to honor the memory and spirit of the living rather than mourn for what cannot be. I realize there is no way to know such things, but what are your thoughts on the afterlife? Marina Abramović: I don’t know anything about the afterlife because I haven’t been there yet. The only thing we can organize is the funeral. It’s very important to die consciously without anger and without fear. From Rachel Denny via email: Why do you feel it is important to leave a legacy and to be remembered? MA: I feel that my legacy will be my institute [the Marina Abramović Institute for the Preservation of Performance Art in Hudson, NY]. The mission is to preserve the legacy of all forms of performance art from the 1970’s until the future. From Sarah Hollars via email: What is your favorite word? What is your least favorite word? MA: [My favorite word is] Suchness: Tibetan term for the emptiness. It’s emptiness with meaning. Full emptiness. I don’t have [a least favorite word]. From Patrícia Corrêa via email: How does your inner body time perceive the exterior time? MA: Time is an illusion. Time only exists when we think about the past and the future. Time doesn’t exist in the present here and now. From Alan Freshman via the Art21 Blog: Do you give birth to your art and life primarily from the silence at the core of your being? MA: My ideas come as a surprise to me. It can be anywhere at any time. The best ones are the ones that appear unexpectedly. Any idea that I am afraid of is valuable to explore. My best ideas come when I am in nature. The places, I call them places of power: waterfalls, oceans, mountains, volcanoes. From Chris H. via PBS.org: What separates humans from nature or are we one in the same? MA: The big problem of our modern society is that we feel that we are separated from the nature. But it’s just the opposite. We are interrelated and our DNA is the same. And only when human beings understand that, the nature will not be obstacle.